Iranian nuclear envoy: Iran accepts uranium processing draft deal "in principle"
IAEA chief says draft deal is "balanced approach to the problem"
VIENNA, Austria (CNN) -- Iran has accepted a draft agreement that calls for some uranium produced in Iran to be sent abroad for further enrichment, an Iranian diplomat said Wednesday. 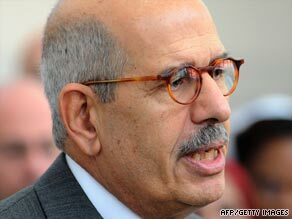 Mohamed ElBaradei says the agreement is a "balanced" approach to the problem. "In principle we have in fact accepted this offer for this Tehran ... reactor in spite of the fact that we are capable of producing the fuel," Ali Asghar Soltanieh told CNN's Matthew Chance in Vienna. "But we decided to welcome this offer in order not only to show our transparency and cooperation but prove that all activities are for exclusively peaceful purposes." Soltanieh is Iran's ambassador to the United Nations' nuclear watchdog, the International Atomic Energy Agency. He spoke shortly after concluding three days of discussions at the IAEA's headquarters here with representatives from the U.N., France, Russia, and the United States. The draft agreement is "the summary of the discussions that we have had" since Monday, which Soltanieh described as "elaborating on all aspects of this project for fuel for Tehran's reactor," Soltanieh said. He and the other representatives from France, Russia, and the United States are taking the draft agreement to their respective governments for approval. IAEA chief Mohamed ElBaradei has given all the representatives until Friday to say whether they will sign the agreement, which ElBaradei described as "a balanced approach to the problem." Soltanieh would not elaborate on the draft agreement until it is finalized, but he told CNN that Iran plans to continue its uranium enrichment program at its Bushehr nuclear power plant. The delegates hammered out the details of a tentative deal reached in early October which calls for low-enriched uranium produced in Iran to be sent abroad for further enrichment and then returned for use in medical research and treatment. Tehran says its nuclear program is intended solely for peaceful purposes. But many in the West believe Iran is pursuing nuclear weapons capabilities. The Obama administration is working on a substantial sanctions package against Iran in case current diplomatic efforts to curb its nuclear program fail, top officials told Congress earlier this month.